In December 1919, Mr WF Lidbury, secretary of the Mancott Royal Tenants Association, wrote an open letter to the Prime Minister, David Lloyd George, about Her Majesty’s Explosives Factory at Queensferry in North Wales. 1 Not only had the factory fallen into disuse and the vast majority of the workforce been laid off, but the houses and hostels built specifically to accommodate the workers were now standing empty. Why, he asked, given the country’s housing crisis, was the Ministry of Munitions refusing to rent out these properties? Surely, he argued, the factory could be used for peacetime production? He suggested several possibilities for this, including the manufacture of agricultural machinery, which would provide employment opportunities and boost the local economy. Queensferry explosives factory was established on the site of a disused boiler works. Initially, in 1914, it was acquired by the government for use as a prisoner of war camp but it was soon developed into a huge munitions production plant, occupying 298 acres, including some former agricultural land between the Chester to Holyhead railway and the River Dee. Nitrocellulose, tetryl and TNT were manufactured here. The work was dangerous and there were many accidents. Consequently, the site had its own hospital and between 1916 and 1917, it treated 19,000 people. In addition to the production units, three eight-mile pipe lines were constructed – two to dispose of waste into the Mersey and another to deliver four million gallons of water a day to one of the production units. Dozens of stanchions were erected to support the cables carrying electricity to the site. During its maximum production period there were seven thousand employees, three thousand of whom were women. Six hundred workers were police, welfare and medical staff. So what became of Mr Lidbury’s plea to Lloyd George to do something constructive with this massive investment? Was the site to become a national industrial asset providing a good living for the local populace or was it to be a wasteful white elephant? Well, it would appear that after the war the government kept some of the site as a Stores Depot for locomotives. This was put up for sale in 1931 but, by 1939, it had again fallen into disuse when it was acquired once again by the government. By the mid-1950s only a small stores depot remained on the site. 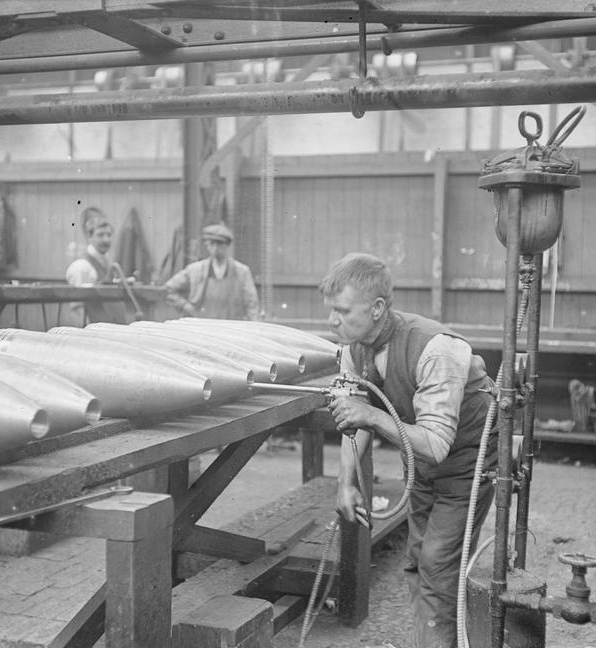 Read about an attempt at Woolwich Arsenal to ensure alternative work was provided for armaments workers after the war here.